The National Hemophilia Foundation&apos;s 69th Annual Meeting will be held August 24, 2017 – August 26, 2017 in Chicago, Illinois at the Hyatt Regency Chicago. Join us for three days full of educational sessions, networking opportunities, and access to our exhibit hall. From the 26 miles of lakefront along beautiful Lake Michigan to the Magnificent Mile of shopping and entertainment, Chicago has something to excite all tastes and styles. It has the most Regional Tony Award®-winning theaters in the nation-Chicago Shakespeare Theater, Goodman Theater, Looking glass Theater, Steppenwolf Theater Company, and Victory Gardens Theater. Chicago is one of only three U.S. cities with a Michelin Guide, and its world-renowned museums have exhibits that cover every aspect of human culture, the Earth, and beyond. We invite you to experience Chicago&apos;s breathtaking skyline, the awe-inspiring Millennium Park, and the local charm. 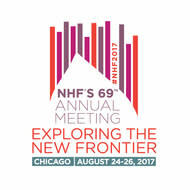 See you at NHF&apos;s 69th Annual Meeting!